That is the fact I am getting slower and it could quite possibly be something to do with my age. 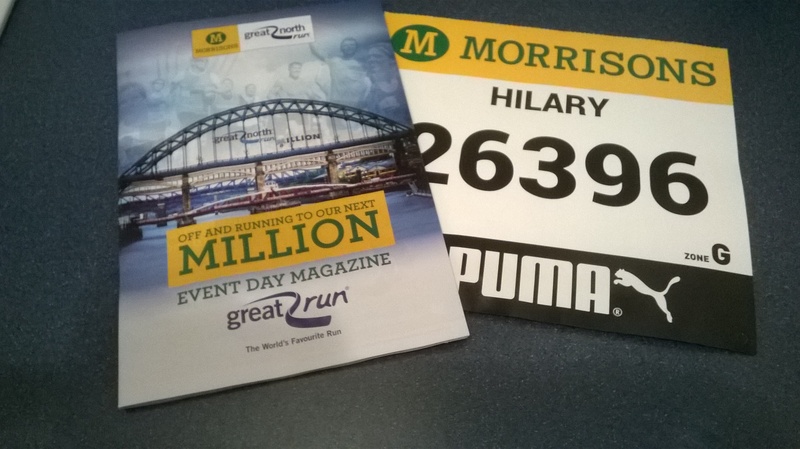 But before that – the dream I had about missing the start of the Great North Run? Well, it nearly did come true! I’d gone to bed on Saturday night with three alarms set for some ungodly hour. Fortunately, one went off, I woke up and got out of bed straightaway. Which was lucky as the alarm on my phone might have gone off but I’d left the phone on silent!!! The hotel alarm which I had tested the day before was all set, but I’d forgotten to turn it on again after my testing manoeuvres! Having showered, etc, I toddled off to the restaurant for breakfast which had opened extra early for us runners. There was me and three other lonely souls toying desultorily with our food. Fuel ingested, I went back to my room where everything was laid out ready for me and once ready to go I looked around for my car keys. Where were my car keys!!?? Oh, expletive, expletive, where are my bloody car keys? I’ll skip over the tears of frustration, the desperate emptying of bags in my search and the wondering how on earth I would explain missing the run. Luckily I did find them hiding in a pocket and eventually set off to my transfer pick up point. 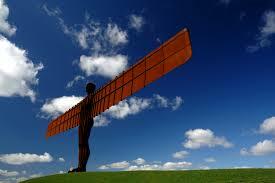 This year the skies were blue and cloudless and I saw the Angel of the North. And as much as it is pretty impressive, the years since its installation in 1998 have seen trees grow up around it and now it seems to just peep over the top. The journey into Newcastle proceeded without incident, a quiet coach of runners and spectators, either contemplating the task ahead or just not quite awake yet. The coach driver very helpfully shut the doors with a cheery “can’t change your minds now”! It would have been oh so tempting to stay on the coach when we arrived at the drop off point when the driver said, “runners time to get off, spectators stay on the coach”. Abandoned on the side of the Great North Road, a marshal instructed us to cross the road, go through the blue gate and cross Exhibition Park, effectively following all the other runners progressing lemming like towards our fate. What he didn’t warn us about were the cows roaming loose in the Park. There is something rather surreal and unnerving about being surrounded by hundreds of cows as they go about their business, even more so when a small group decided to go for a little trot across our path. I arrived at the start area in time to see Denise Lewis and Gabby Logan pull up in a taxi ready for their television stint. Then I spent the next two hours wandering around, eating snacks, drinking water, joining toilet queues, taking layers off, putting layers back on (it was very nippy first thing). Eventually I had to make a decision about just how many layers I was going to keep on because my rucksack had to be left on the bus (unless I wanted to run with it). My charity t-shirt was made of cotton so I’d had no intention of wearing it because I knew I’d be too hot at some point. But the chill in the air told me I might regret that decision, so I loitered in the start area in my running vest, charity t-shirt and throwaway warm top. By 10.00am the heat from the sun was making it very clear that less would be best, so throwaway warm top and charity t-shirt were dispensed with. View from the starting pen! Starting pens began to get fuller as the time progressed and once the wheelchair race and the women’s elite race had started, it was time for the warm up, especially modified for such a packed environment. Then before we knew it the gun had gone and we were off. Considering how far back I was, we started moving quite quickly and by 11.00am we were on our way. Now I’m not sure why, but I started off in the left-hand carriageway which meant we didn’t have the incline of the right-hand carriageway. I kept thinking at some point we would pay for the easier start but that never seemed to materialise. However, it did mean that when the Red Arrows flew over the Tyne Bridge, I only heard them because I was running in an underpass! Am I never to see those damn planes!? My pace for the first mile was a minute slower than my previous attempt but still a little bit too fast so I tried to slow it down a bit, although it didn’t actually feel that fast. 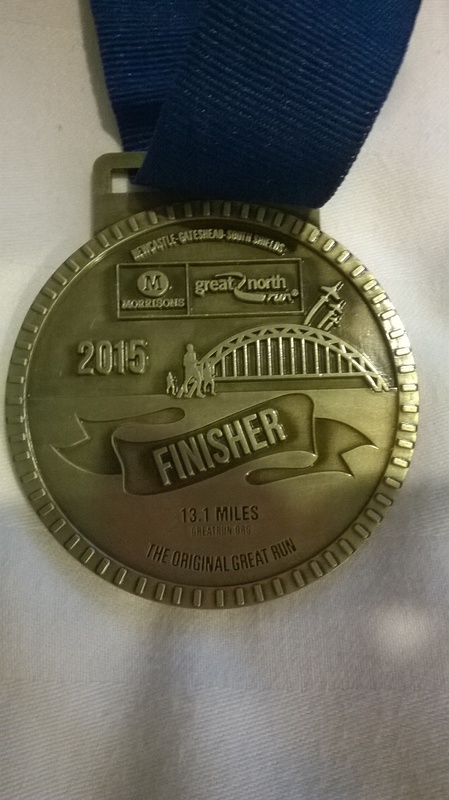 I certainly was feeling relaxed enough to appreciate running over the Tyne Bridge this year. My 5k split time was actually one second slower than in 2010 and my 10k time 23 seconds faster than previously but by this point the stitch which had been hounding me since about mile 4 began to get really annoying. No amount of pushing up and into the pain or slowing the pace was doing much to relieve it so I told myself I would run to the halfway point and then I could walk for a minute. I think it was at this point that I decided I hated half marathons! It was very hot by this point, in fact the automated sign at the halfway point was warning us all to take care because of the heat. I then struggled for a few miles with walk/running although thankfully there was more running than I’d anticipated. Then around mile 9 I began to get a second wind. I wont say I ran all the way to the end because I didn’t but it was a lot better than I thought it was going to be by this point. Luckily the official misting stations were augmented by some locals with hoses, including a fire engine (I’m pretty sure I wasn’t hallucinating but is that even allowed?) and I made use of all of them. By the time I got to the 15k point I knew I was three minutes slower than 2010 so suspected that a GNR PB was not on the cards but was pretty confident I could get a season’s best (okay, so I’ve only done one other half this year but a season’s best is a season’s best!). By the 10 mile point I was trying visualisation techniques. Just a parkrun to go, you’re on the first lap running up to the playground …. But why is it that the routes you see in your head always seem shorter than the distance you’ve actually still got to run! It was with a great sense of relief that not far passed the 11.5 mile point I could see the sea in the distance and I knew the steep decline was ahead of me, followed by the last mile along the sea front. The crowds all along the route were incredible but on this last stretch they were really willing you along to the finish line. I’ve heard it said that the crowds here are even better than at the London Marathon and I have to say I agree although I couldn’t actually say why. It’s not just the vocal encouragement or the amount of oranges, sweets, biscuits, cups of water, etc proffered out to you. There just seems to be something special about the people of Newcastle/Gateshead/South Shields. In the last 800m I ran alongside a couple and it was obviously the female’s first time. Her partner asked whether she’d enjoyed it and she said she had. To which he replied “I didn’t” and I concurred with a “Neither did I”. At which point another runner joined in with a “It was hot, wasn’t it?” but as we crossed the finish line we congratulated each other. As often happens with me, as much as the run had been tough, as soon as I finish I’m absolutely fine. Apart from my appearance, you wouldn’t know I’d been running. I wouldn’t go as far as saying I could do it all again but …. Actually before I even got to the end and despite the “pain” I was already thinking I want to do this again next year. What’s the betting I wont be lucky in the ballot anymore! What made the finish even more special was after missing out on the Red Arrows at the beginning, I was in time to see their spectacular display over The Lees. In fact you’re lucky this blog piece isn’t just pictures of their acrobatics! Oh, and did I get a season’s best? Yes, by one second!!! Back to my title, “Accepting the Unacceptable”. At some point during the run, I began to acknowledge that my times for half marathons at least are getting slower and that perhaps I should stop chasing PBs. I also pondered whether this is down to the ageing process, although I really don’t want to accept that. On a more sombre note, I should also make mention of the sad death of David Colley during the run. 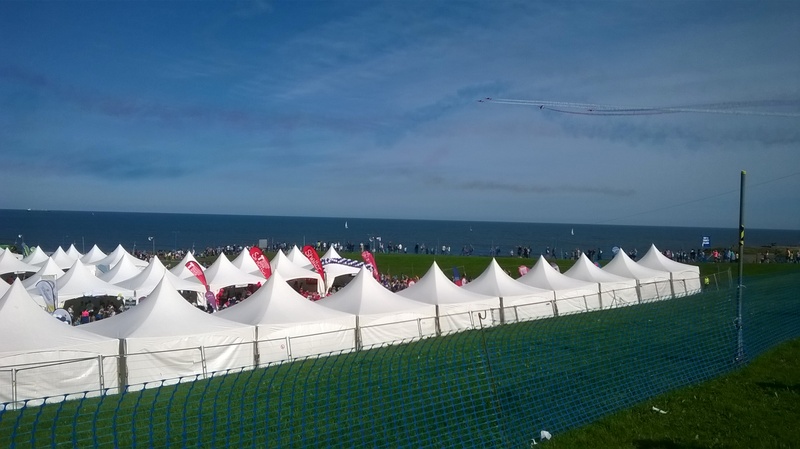 As somebody commented when the news originally broke, there did seem to be a lot of blue flashing lights around the latter half of the course and particularly at the end. It’s just so sad that somebody should lose their life doing something they enjoy and my thoughts are with his family and friends. In a week’s time, it’ll all be over – presumably! 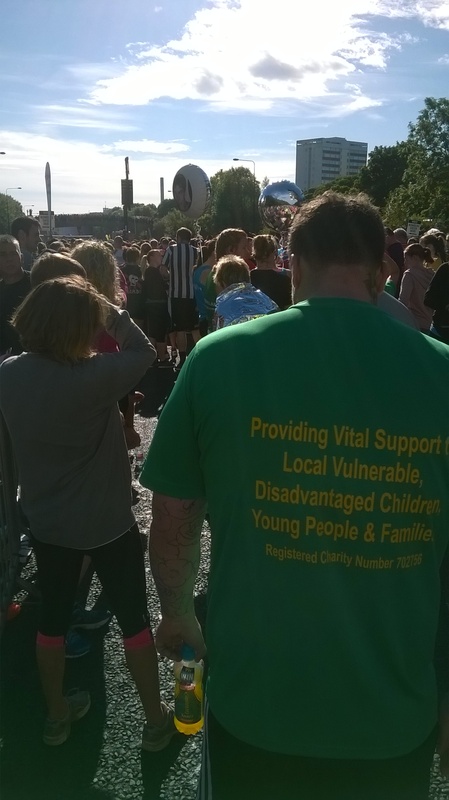 My second attempt at the Great North Run will be completed and that thought has led me to reflect on my first attempt and my memories of that event. Perhaps what’s particularly scary is that my first attempt took place in 2010 – five years’ ago! Was it really that long ago – wow, how time flies. So my recollections of five years’ ago. Travelling up to Durham, where I stayed – there being no taxis at the station and a large number of runners (and others), wandering around aimlessly trying to work out how to get to their respective destinations. Eventually some taxis appeared. Opening my hotel door at 5.30am the following morning to receive my breakfast to see it was still dark and it was raining – a lot! Being transported by a pre booked taxi 90 minutes later to my transfer drop off point – it was now light, but still raining – a lot! 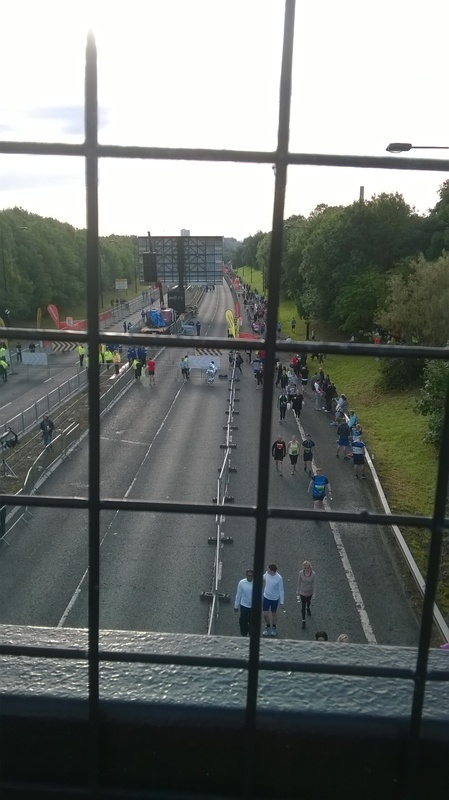 I remember not being able to see the Angel of the North during the run transfer because of the rain. Perhaps if the sky had been similar, I’d have noticed this! Being dropped off near the start area in Newcastle just after 8.00am – yes, you’ve guessed it – still raining – a lot! 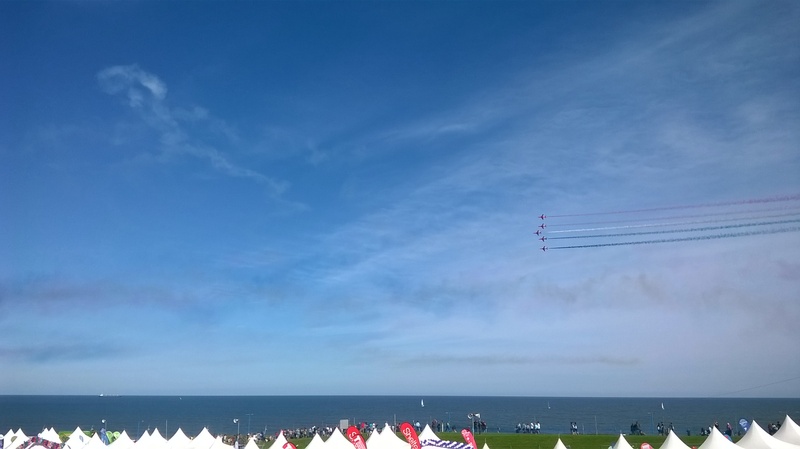 About an hour later, suddenly feeling very lightheaded – panic and stuffing emergency oatcakes down my throat as quickly as possible so they had time to digest before the start. I put this down to the very early breakfast, which to be honest I didn’t really fancy and didn’t actually eat a lot of. Oh yes, still raining – but not quite so much. 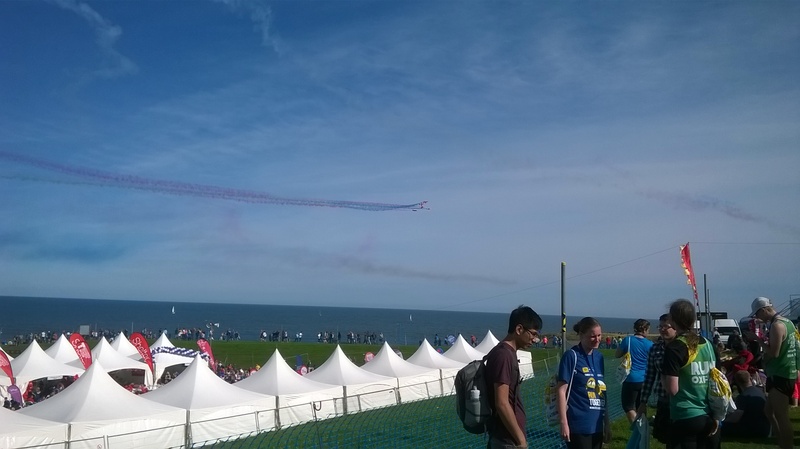 By the time the run started, it had of course stopped so we were set off on our way by Ant and Dec and I remember seeing the Red Arrows. 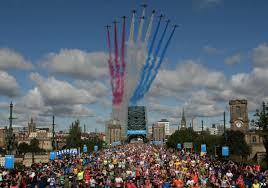 What I don’t really remember (sadly) is the Tyne Bridge. I know I must have run over it but by this point I had exerted myself so much that I was already struggling and we weren’t even a quarter of the way through. I remember the gang of “youths” who threw bottles of water at us as we passed and I remember some of the male runners lobbing them back! I remember the man standing on top of the bus shelter “cooling” us down with his impromptu misting station (a hose!). Although by this time it was a bit irrelevant because it had started to rain again. I remember the steep hill down to the coast at South Shields and mistakenly thinking that there wasn’t much more to go. No Jones, only another mile at least! I remember walking back to my transfer coach and hearing the Red Arrows. Couldn’t see them because by this time the skies had clouded over and as I took my seat, the skies literally opened. I remember the tedious journey back to Durham with queues of traffic everywhere. I remember really looking forward to a piping hot shower when I got back to my room only to discover there was only a very tepid supply in evidence. Having said all that, I’m doing it again so it can’t have been that bad! This morning somebody asked me if I was looking forward to it and yes, I am. In fact, I’m already thinking about when I do it again next year – maybe getting a little bit ahead of myself there but there’s nothing like forward planning. To avoid the taxi debacle, I’m driving to Durham. My theory is that the drive will tire me out and I should sleep well that night. Although hopefully not too well, I don’t want to sleep through the alarm! I have already had the nightmare about not getting to the start line in time. To make sure I have enough sustenance inside me, I’m taking breakfast cereal with me as well as other snacks to keep me going during the wait for the start. *yes, I know, the lyrics are fog on the Tyne but it’s called poetic licence!